“Killing_Hope” was and still is the principle of the US Power Elite in general towards the global South but in particular to Latin America. The “Shock_Doctrine” is reigning. Cuba gained independence from US Neocolonialism and preserved it since Castro. Let´s hope they´ll not find a deadly embracement now. The US have waged a “Roll Back” in the recent years, including some sort of Coup d´Etat in Brazil. Of very special interest to the US Power Elite is Venezuela. The first CIA inspired coup attempt against Chavez was turned down by a mass_uprising in 2002. Even the New York Times admitted the “CIA_knew_of_a_coup_plot”. In 2014 Counterpunch stated that Venezuela was under US attack again. And can you believe, in 2015 the “US_declared_Venezuela_a_national_security_threat”! And in deed obviously the_attack_is_stepped_up! Actually the question doesn´t appear absurd: Could Venezuela become a “Syria 2.0”? But this question put by “International_Policy_Digest” appears a bit fishy, like a “Prophecy” expressed saying neither who really brought the mess to Syria nor saying who´s behind the turmoil in Venezuela! And, what do you think is to be found in Venezuela? The Worlds_biggest_oil_reserves! At the core of all this: globalized Capitalism! The forces representing it also fear Venezuela to become an example for other parts of the world, especially in Africa. Sehr bald wurde die Monroe-Doktrin so verstanden: ganz Amerika der US-Macht (Elite)! Fast alle Länder des Doppelkontinents mussten diese Erfahrung machen, Lateinamerika wurde_zum dauernden_US-Terroropfer! Besonders die Länder mit einem großen indigenen Bevölkerungsanteil oder mit mehrheitlich schwarzer Bevölkerung wie Haiti oder Grenada haben nicht einmal formalen Respekt vor ihrer Souveränität zu erwarten. Übrigens spielen die Clintons auch in Haiti eine unselige, besser gesagt, verbrecherische Rolle. “Killing_Hope” (die Hoffnung zerstören) ist die Maxime der US-Macht, auch hervorragend in “Die_Schock-Strategie” von Naomi Klein beschrieben. Kuba hat sich durch Castro und seine Revolution aus diesem Zustand befreit, abzuwarten ist, ob das Land nun nicht in eine “tödliche Umarmung” durch die USA gerät. Vielleicht bewahrt Trumps “Getrumpel” davor. Tatsächlich ist das große “Roll Back” der linken Entwicklung durch die USA in gange, wie auch der “Putsch” in Brasilien gezeigt hat. Venezuela: „Syrien 2.0” in Sicht? Seit der “Bolivarischen Revolution” unter der Führung von Hugo_Chavez befindet sich Venezuela im Fadenkreuz der US-Machtelite. Schon 2002 unternahmen die USA einen gescheiterten Putschversuch_gegen_Chavez. Der_Krieg_gegen_Venezuela geht unvermindert weiter. Dies ist auch ein Handels- und Finanzkrieg gegen das Land, um die Bevölkerung “mürbe” zu machen, die Unzufriedenheit zu schüren und die Regierung zu vermehrter Repression gegen die Konterrevolution zu zwingen. Die westlichen Medien sind dabei “verlässliche” Helfer. Dies erinnert fatal daran, wie die US-Machtelite mit ihren europäischen Vasallen zusammen den Krieg in Syrien vorbereitet hat. Und, was mag wohl in Venezuela zu finden sein? Wahrscheinlich die weltweit größten Reserven an Erdöl in einem einzelnen Land! Und niemals vergessen, im Kern dieser furchtbaren Entwicklungen: der globalisierte Kapitalismus! Habemus Papam: A Cover Up?! A new Pope has been „elected“, a “Latin American”! The Western Press is in euphoric mood, do Latin America and the Southern Hemisphere have reason to be euphoric too? Has the so called election only to do with clerical needs and demands? One should remember a number of things! There are many links between the Catholic Church and the mighty and powerful Elites in the West. Pope John Paul II played an important role not only in the crumbling of the East Block especially in his country of birth, Poland, but also in the efforts of US Power Elite not have the Soviet inspired system of Poland to be transformed into an economic democracy but to apply “The Shock Doctrine” on the people of Poland in order to implant neoliberal Capitalism and take the property of the Polish people into capitalist hands. 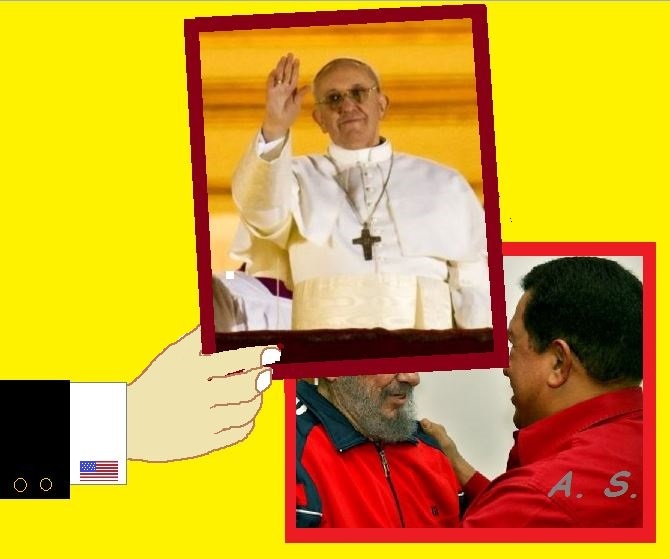 Don´t believe that the Cardinals are electing the Pope only according to religious points of view. The power machinery, the secret services, know quite well about the “private” life of them and has enough insights to direct what´s going on! So, if knowing about the unscrupulous methods and influences on the church and through that institution on society (manifested for example in the Propaganda Due, P2), one has to ask oneself: why a Pope from Latin America now?! And don´t fall into the trap of the mainstream media: “well, the majority of Catholics are living there”! No one in power cares for the majority but is calculating with them. The answer could be quite simple: Latin America is making great efforts to wind itself out of the grip of “Big Brother”, out of the grip of the US Power Elite! Leftist governments are on the march. Outstanding figures are almost gaining cult status. One great personality in that struggle has just passed away and questions are in the air (http://tinyurl.com/atrxa4n). The idea of using the countries´ recourses to feed their people is spreading. On the other side the Catholic believe is running high in that region of the world. With a new Pope who is known for his obedience to power as it has been proven during the time of the military junta in Argentina (http://www.guardian.co.uk/world/2013/mar/14/pope-francis-argentina-military-junta) Big Brother might harbor the hope to divert Latin Americans from “dangerous ideas”!